Located adjacent to the world-famous Boardwalk. Caesars Atlantic City features more than 2,000 slot machines, including progressive and video poker in many denominations. This Atlantic City casino offers more than 2,000 slot machines the newest penny and nickel games. ALL NEW SPORTS BOOK NOW OPEN!!! Qua Baths & Spa and the outdoor pool are located in the Ocean Tower. The Bellezza Salon is located in the Centurion Tower. The Beach at Caesars is located on the right side of the Pier Shops at Caesars, just in front of the casino. 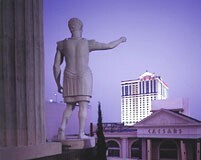 Caesars features these nightlife areas: Dusk Nightclub and 21 Sports Bar at Dusk, the Boardwalk Beer Garden, and Toga Bar. Headlining concerts and shows can be seen at the Circus Maximus Theater.